Washington Examiner is relaunching its weekly magazine for a national distribution, with a new look and more life and culture coverage. It will expand beyond the conservative publication’s Washington, D.C. audience starting January 1. “Over the years, we’ve frequently been asked if individuals outside of the Beltway could subscribe to the publication,” stated Ryan McKibben, president-CEO of publisher Clarity Media Group, the Denver-based company that owns the Washington Examiner and The Weekly Standard in D.C., as well as other publications in Colorado. The Washington Examiner has also grown its online readership recently. According to the latest analysis of Comscore data by TheRighting, a media company that aggregates articles from right-wing media outlets, the Washington Examiner grew its online audience by 15% year-over-year in October 2018, making it the third-largest conservative website in the U.S., behind Fox News and Breitbart. The Washington Examiner has hired Seth Mandel, op-ed editor of the New York Post, to be executive editor of the print magazine, reporting to editorial director Hugo Gurdon. A small team will be hired to produce the new national magazine. Starting next year, Washington Examiner will include life and culture content. “Your Land,” for example, is a new section with stories about the evolving social culture of America and how changes to the “the core values of the nation” “are being promoted and resisted by different groups,” according to the publisher. “Life & Arts” is another new section with columns on “Outdoor Life,” “Life in Uniform” and “Traveling Life,” as well as on culture, books and sports. Washington Examiner will also feature a personal finance column in its Business section, a crossword and a regular obituary column. The politics and policy sections will be combined into a “Washington Briefing” section in the new magazine. “The new Washington Examiner will include all of the news, analysis, and commentary that readers have come to expect for nearly 13 years, but now it will also include a great many regular new features that appeal to a more diverse array of readers across the U.S.,” according to Gurdon. The magazine will publish 44 issues a year, for $199. The current magazine has a print circulation of 40,000 in the Washington, D.C. area. The redesign will be reflected across all of the publication’s digital assets. 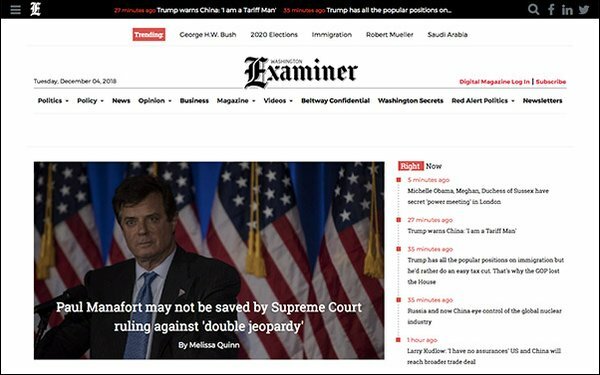 The Washington Examiner was a daily print paper until June 2013, when it dropped its coverage of local Washington news and relaunched as a weekly magazine focused on national politics. The shakeup resulted in the layoffs of nearly 90 employees, according to The Hill.